These 2 weeks I migrated rails-bestpractices.com to rails 4 from rails 3.2.13. Here are some experience I'd like to share with you. rails-bestpractices.com has many rspec and cucumber test code, they can find out most of warnings and errors after migration. This is my railsconf 2012 video on youtube. bullet is designed to help you reduce the number of db queries, such as adding eager loading to kill n+1 queries and removing unused eager loadings. bullet works well in activerecord from 2.1 to 3.2 before, today I released bullet 4.0.0, it starts to support mongoid (>= 2.4.1) now. Why does bullet need to support mongoid? Does mongo also have n+1 queries issue? If you have any questions or suggestions, feel free to email me, tweet me or open issues on github. By default activerecord works well with single db, it's applicable for most of websites with small/medium traffic, but if you website grows fast and gets much more reads than writes, you should definitly set up master slave replication for your databse. All inserts/updates are sent to master db, and reads are sent to slave db, it will reduce read load on your master db. bullet is a gem to help you increase your application's performance by reducing the number of sql requests it makes. Today I released bullet 2.3.0 to better support rails 3.1 and 3.2 and performance improved. It's a long time I didn't do any changes to bullet, let me tell you the story I work for bullet 2.3.0. At the beginning of this month, bullet got its 1000th watcher on github, I realized it's time to improve it e.g. speed up and compatible with edge rails. Rails 3.1 has been released for a long time, asset pipeline becomes more and more popular, I also upgraded my rails website. I used nginx + passenger for my rails projects, but nginx only supports dynamic gzip support (compress in runtime), there is a http_gzip_static_module for nginx, which can make full use of rails asset pipeline. We are using RabbitMQ as our message queue system, ruby client is workling. This week we encountered a strange issue, we create a notification, and define an after_create callback to ask workling to find that notification and then push the notification to twitter or facebook, it works fine except that sometimes it will raise an error said "can't find the notification with the specified ID"
My presentation in RubyKaigin 2011 today. View more presentations from Richard Huang. 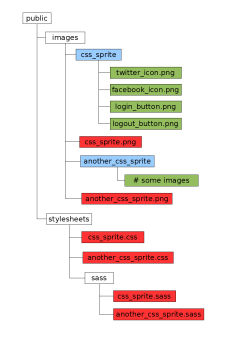 The advantage of using the css sprite is to reduce a large number of http requests, so it makes the web page loaded much faster. I often find it it painful for me to compose a lot of images into one css sprite image and measure the x and y positions for each image. raise ArgumentError, "Delegation needs a target. Supply an options hash with a :to key as the last argument (e.g. delegate :hello, :to => :greeter)."